You can give up to $15,000 per year of cash or property (in 2019) to as many people as you wish without filing a gift tax return. The gift is not taxable to the recipient. 1. Gift tax, if due, is generally paid by the DONOR, not the recipient. 2. There is an annual gift exclusion in 2019 of $15,000. You can give $15,000/year to as many people as you want without having to file a gift tax return. 3. Under current law you can give away $11,400,000 during life and at death without owing any gift or estate taxes. 4. The purpose of the gift tax return is to track how much you are giving away during life. 5. A married couple can give $15,000/year each to as many people as they wish. But may need to file a gift tax return to declare they are splitting the gift. 6. If you give someone more than $15,000 in a year (or $30,000 for a married couple), then you need to file a gift tax return. 7. Payments made directly to an educational or medical institution for someone else are exempt from gift taxes; no gift tax return is required. 8. Gifts to a spouse are exempt from gift taxes as long as the spouse is a US citizen. 9. 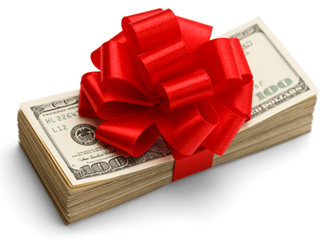 Gifts to a political organization are exempt from gift taxes.